Sumo is so cute with bowbiz. Thank you for a very gorgeous bows. My little Lhasa Apso, Daphne, has to have a topknot to keep her really fast growing hair out of her eyes. I started to think that having a topknot isn't much more economical than always going for trims because the bows I purchased didn't really stay in top condition for any length of time to make the investment worth it. Now I found BowBiz. My frilly tomboy Daphne has a little wardrobe of durable and very adorable bows. She gets lots of compliments and I am happy with the barrette option because I need to get her top knot together quickly. Thank you! I am also so happy with the surprise bow. It's very nice. I also want to thank you for free bow. Again, so adorable. Daphne and I couldn't be happier that we found BowBiz. Your bows are made so well that they completely live up to your Youtube video demonstration. You can smash, stomp, etc. and BowBiz look great and hold up perfectly! Again, THANK YOU. I wanted to take a moment to thank you so much for the beautiful dog bows. They looked beautiful on your website and even better once I saw them. I have, in the past, tried making my own bows, but after seeing yours, I will now leave that job up to you .... a true professional! I was also very impressed with the packaging and how quickly I received them. 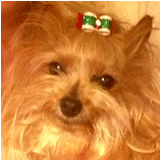 I've included some pictures of my dog Snickers wearing your bows. She's quite the diva now! Thank you so much again and I'll be placing another order with you in the near future. I had done a lot of research on the Internet for bows for my new baby girl teacup yorkie. All the other websites I looked at (just about all of them) couldnt even compare to bowbizdogbows.com! Susan was a pleasure to work with and very fast to get back to my email! You won't find these quality bows anywhere else! Wouldn't shop for my baby girls bows anywhere else! Thanks Susan!!! 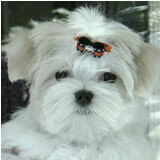 I have ordered bows for my Shih Tzu twice now. I love the quality of each and every bow. Shipping is super fast too. I will never order bows anywhere else. Apple is 4 months old now and is able to wear her puppy bows. Can't wait till she has enough hair to wear the rest of her pretty bows. Thank you so much. Placing a repeat order right now!! Just gave our precious Yorkie, Saydee, her weekly bath ( we like to call it "beauty shop" ) and as I was putting her hair in one of the beautiful quality bows from your company, I thought I would jump on the website and order more today!! Love Love Love your selection, ease and speed of shipping, and everything about BOWBIZ! I have received my order and just wanted to let you know that I think the bows are beautiful. I can't believe how quickly they arrived and the complimentary bows were a lovely surprise! I will definitely be placing many more orders in the future! May I just say that your work ethos and the quality of your bows is really something you should be extremely proud of! It's very refreshing to find a business that genuinely cares! I will have to get a picture of Rylie with her new bows and send to you. Thanks again for your help, I love shopping with you at your company. I received my order today and I was SO IMPRESSED!! The bows are stunning! again for the amazingly beautiful bows! LOVE, LOVE, LOVE 'EM!!! The bows are beautiful, thank you so much Susan. Our boy will debut in the show ring looking so handsome in his new black bows from you. So beautifully made! My bows arrived today and they are awesome!!! Thank you for customizing the baseball bow for my baby. You are so generious. Lexi spends every weekend with my gandsons, their teams & siblings. They will be ecstatic over her baseball bow. The alligator clips with gripzie make it possible to use the bows without bands (great for her fine coat). Your bows and your customer service is beyond excellent. I will be sharing your product and website with friends & family. Working on another order to send in a few days. I will send Lexi's picture soon. Bella's bows arrived yesterday and I am thrilled with them. The quality is amazing and they are so pretty. I will definitely be ordering more as she just passed her test as a therapy dog test and they will be perfect for her to wear when we are visiting. As soon as I get a picture of her I will email it to you. Thanks for the extra bow and grooming bands. That was very thoughtful of you. I have today received my beautiful array of bows that I ordered. I am soooooo pleased with them. They are fantastic - and THEY ARE made so well. I have not seen beautiful ones like you do and it is hard to pick out my TOP CHOICE, - they are very unique and I am thrilled with them. You are certainly in my favourites. Thank you again for them, and I hope you and family have a beautiful and safe Christmas. God bless to all.